Liverpool go into the match two places clear and just one point ahead of Everton in the league standings. 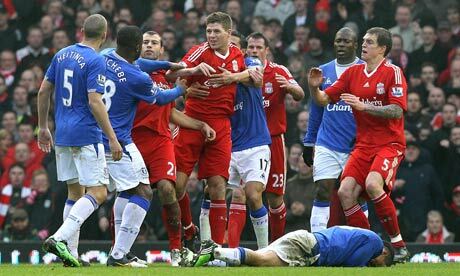 The Reds will want to respond to a poor 2-2 draw with Aston Villa, whilst Everton know that they can leap frog their city rivals with a famous victory at Anfield. 2-0 victory on Saturday afternoon at Championship side Bournemouth. Osman and Lukaku will be expected to return to the starting lineup with Kevin Mirallas reverting back to a attacking midfield role having led the line against Stevenage. Bryan Oveido suffered an horrific double leg fracture. Alcaraz and Deulofeu could come back into contention, but Barkley, Gibson and Arouna Kone are definitely out. Martinez could include new signing Lacina Traore in his squad for the first time. There have been more red cards in this Premier League fixture than any other. Liverpool have lost just 1 of their last 14 Premier League Merseyside Derbies, winning 7. Fans will be hoping for more of the same which the two sides produced at Goodison earlier in the season when the two sides played out a 3-3 draw. Liverpool (4-4-2): Mignolet; Kelly, Skrtel, K.Tourè, Flanagan; Gerrard, Henderson, Sterling, Coutinho; Sturridge, Liverpool. Everton (4-3-3): Howard; Hibbert, Baines, Distin, Jagielka; Osman,McCarthy, Barry; Naismith, Mirallas, Lukaku.